The new Echo Plus is still the smart speaker we all know and love, but this time around, Amazon has eschewed the metallic cylindrical looks of last year’s Plus and imitated the fabric-covered tin of beans chic of the second-generation Echo. It has improved sound – that’s a given – but there’s also a built-in thermometer this time to tell the temperature of the room it’s in, which should make smart thermostat features all the more effective. It’s worth reflecting on the journey Amazon has come on pricing in just two short years. The original Echo would set you back £150, before the second-generation slashed that fee to £90. The Plus version, aimed at smart homeowners after a better audio quality still managed to undercut the original Echo, coming in at £140. This new version maintains that enticing price. In terms of competition, that puts it in a place where it almost stands alone. The other better sounding smart speakers – the Apple HomePod and Google Home Max – go for £329 and £399 respectively. In fact, a closer match price wise would be the original Google Home which retails for £129. It uses the superior Google Assistant AI rather than Alexa, but doesn’t have the smart home hub features or the sound quality to match. While last year’s Echo Plus kept the tall cylindrical design of the original Echo, the metallic look is officially gone from Amazon’s closet with this new model. The new Echo Plus copies the look of the second-generation Echo but with its very own slightly softer spin: it’s dumpier, and fabric covered, intended to stand out less obviously in the home. It’s generally an improvement but the change does come with one disappointing casualty: you can’t twist the top of the speaker to adjust the volume. The big circular status LED is still there, but the physical buttons on top are the only way to alter the volume without raising your voice, which is a pity. If it sounds like I’m describing a second-generation Echo here, it’s because I basically am. Put them side by side and you might struggle to tell the difference. The 2018 Echo Plus is slightly fatter — 11mm fatter, to be exact — and it has rounded edges at the top instead of sharp ones, but that’s it. There’s still a line-in or out connection on the back, so you can either play music directly from a source, or output the audio from the Echo Plus to another speaker. On that note, let’s talk about audio quality. You do get a boost from the new Echo Plus: while you’re looking at (or listening to) the same 0.8in tweeter from the previous generation model, the woofer has gone from 2.5in to 3in. In layman’s terms that means the higher frequencies will sound the same, but the bass notes should get a little boost. And that’s exactly what the new Plus delivers in practice. Compared with the launch Echo in my house, the sound quality is night and day better, with rich, warm notes and decent bass replacing the somewhat harsh and thin output the original Echo was prone to delivering. It’s loud, too – almost unfeasibly so for a speaker this size – but bear in mind that it does distort if you turn it up too high and the higher frequency notes tend to eclipse the bass when pushed. This is a speaker for listening to at quiet to medium levels; it’s not much of a party speaker. The big question is whether it’s as good as the Apple HomePod. Well, no, it isn’t but it’s also less than half the price and it certainly feels good enough value to justify the £140 price. Moreover, if you want more volume, Amazon lets you combine two of these second-generation Echo Plus speakers together in stereo. Amazon even sells a bundle with two Echo Pluses and the all-new Echo Sub for £299. That’s pretty darned good. Does doubling the number of Echo speakers magically make it as good sounding as the Google Home Max? Well, I don’t know for sure as I haven’t had the opportunity to test both systems side by side, but three speakers are usually better than one and, since the sub reaches down as low as 30Hz and a larger 6in driver than the 4.5in drivers in the Home Max, I’d say it’s at least as comparable. All the same, getting two and a sub for less than a single HomePod is sensational value, and a hell of a lot more versatile, giving you the option to split the system up for a multi-room Echo setup when you don’t want the surround experience. Of course, a smart speaker is about more than just sound quality, and this can be broken down into two parts: intelligence and compatibility. In the great virtual assistant race, Alexa sits distinctly mid-table. It’s not as smart as Google Assistant, but some way ahead of Siri and Cortana, while poor old Bixby is still trying to tie its laces. What I mean by this is that, compared with Google Assistant, it’s worse at understanding generic questions and weaker at providing answers, even when it does. So it’s only out by about 39,940,000, then. Insert your head-smacking emoji here. That may sound like picking on one silly example but it’s illustrative of the problems Alexa has; it just isn’t great at contextualising. It’s good for the simple things – telling you the weather, playing music or radio, turning lights on and off and setting alarms – but the more esoteric questions often leave it stumped. Google Assistant isn’t perfect, but you have much more confidence that it’ll come up with *something*. In terms of compatibility though, it’s a different story. Alexa has thousands upon thousands of abilities, many developed for it by third parties, and its skillset is growing every day. 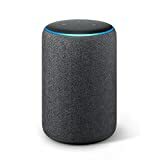 It can serve as a high-tech intercom, allowing you to “drop in” to other Echo speakers on your home network (the Google Home only allows you to broadcast messages, not carry out a two-way conversation) or the Alexa apps on your favourite contacts’ smartphones. And because the Echo Plus includes a ZigBee smart-home hub it can also talk directly to many smart home devices – from your Philips Hue bulbs to your Hive Thermostat – without needing a special hub. The Echo Plus’ built-in thermometer adds another dimension to this and allows users to carry out actions based on the temperature in your room. If you’re already joining the dots here, then you’re exactly the kind of person this is aimed at, but for those that aren’t: it means Alexa can judge when a room is getting too hot and automatically turn on a smart fan; or, if it’s too cold, turn on a heater. As before, though, it’s best that you make the Echo Plus your first step in making a smart home. If you already have a smorgasbord of compatible devices, you’ll have to reset all of them to pairing mode before Alexa will acknowledge them. You only have to do this once, of course, but it’s still a bit of a pain. Once again, Amazon has offered steady, solid improvements with the 2018 Echo Plus. The sound is excellent for the price (though, as ever, you can always do better for more money), it’s more compact and more stylish than before and even more feature packed. Alexa could still do with cribbing some trivia from Google Assistant but if you want a smart speaker that gets the basics right and something that can serve as the basis for a smarter home, you can’t go wrong with the 2018 Echo Plus. Especially at this incredible price.